North American SCJs arrive in Congo | Walk with us! Fr. Charles Brown (middle, with blue shirt), Fr. 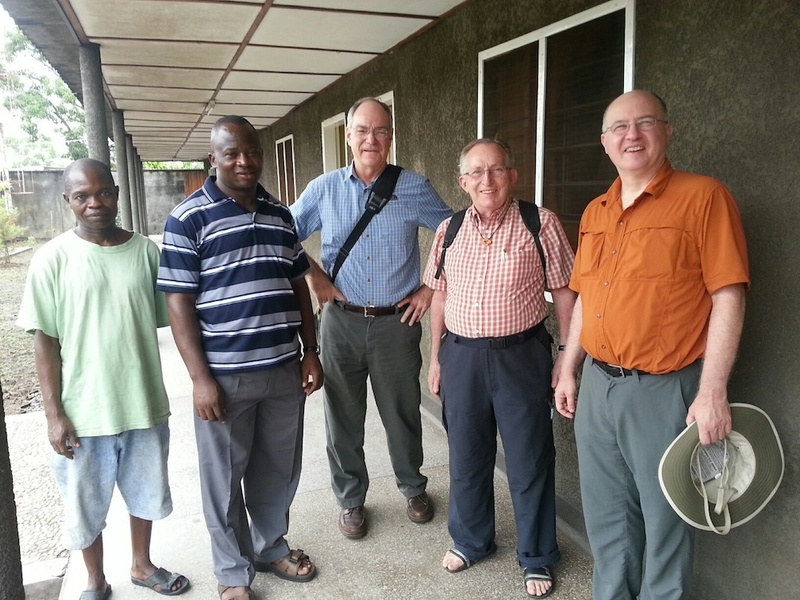 Claude Bédard (member of the Canadian Region) and Fr Stephen Huffstetter with Congolese confreres. Frs. Stephen Huffstetter, Charles Brown and Leonard Elder are in the Congolese Province to take part in its 50th anniversary events of remembrance and celebration. It was 50 years ago this month that 28 members of the Priests of the Sacred Heart were martyred during the Simba Revolution. This year also marks the 50th anniversary of the establishment of the Congolese Province. An 8-hour overnight flight from Atlanta to Paris, immediately followed by another 8-hour leg from Paris to Kinshasa had me feeling weary. But when Fr. Gabriel approached us after we had cleared customs and asked, “Are you SCJ? Welcome to the Congo! !” I felt a sense of rejuvenated excitement. I am traveling with Frs. Charles Brown and Leonard Elder, both members of the U.S. Province who once served as missionaries in this country. We flew over the Sahara desert with the astonishingly vast open spaces. Then as evening settled we crossed over dense jungle forests with few signs of lights or cities. What would I learn from my introduction to Africa? At my brother’s home for supper the night before I left he remarked that growing up in a small town in Indiana, Africa seemed like a distant dream – could I ever have imagined actually going there? Porters aggressively scrambled to be the first to grab our bags, but we insisted on carrying our own. Eric, a young Congolese SCJ seminarian, helped load up the van. While French and four African dialects are the common national languages here, Eric studied philosophy in South Africa and was able to begin my orientation with details about the community and country in English. Eric is set for a missionary adventure, soon to be going to the Venezuelan Province to begin studies in Spanish. When a local church becomes a sending, missionary church, it has reached spiritual maturity. Two SCJs from Cameroon, Jean Baptiste and Jean Marie, arrived just a few minutes after us. Jean Baptiste spent last summer in Hales Corners for our ESL program and greeted us with a hearty hug. The main road was quite good but as soon as we turned off to wind our way to the SCJ formation house we had to slow down to cross rugged uneven surfaces. We received welcome from SCJ confreres from Poland, South Africa and Canada who have also arrived to take part in the celebrations. We enjoyed a hearty meal, conversations in many languages, and then headed for a much appreciated sleep. This entry was posted in Uncategorized and tagged Charles Brown, Congolese Province, Leonard Elder, Stephen Huffstetter. Bookmark the permalink.